Local events are listed below. All events listed here. This is an on the river shoreline cleanup. Canoes provided. Led by Ron Chick, Chair of the River Stewards Initiative of the Friends of Saxonville. RSVP to reserve a canoe at ronchick@comcast.net, or you may bring your own. Meet at 151 Central Street at 11:00 am. Park on Central or a side street. Coffee, snacks, canoes, gloves and garbage bags to be provided. Enjoy a calm canoe paddle, and learn some history of the river in Saxonville and about current threats from invasive aquatic vegetation. Led by Ron Chick, Chair of the River Stewards Initiative of the Friends of Saxonville. RSVP to reserve a canoe at ronchick@comcast.net, or you may bring your own. Meet at 151 Central Street at 11:00 am. Park on Central or a side street. 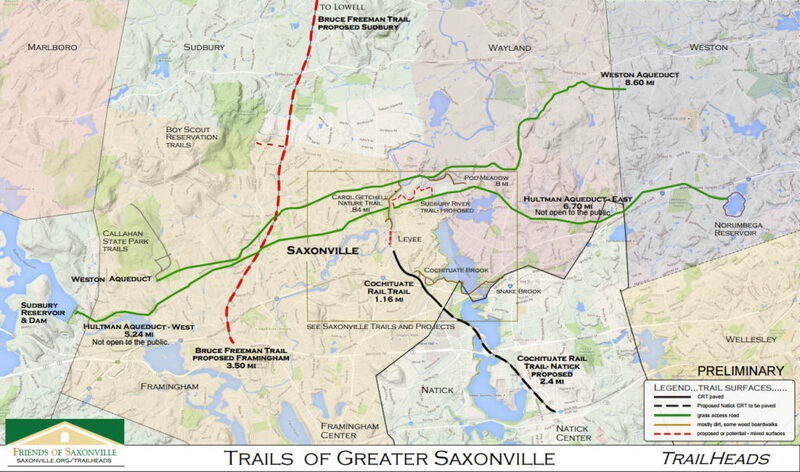 Join the Friends of Saxonville and the Framingham Conservation Commission for a walk along the Rail Trail for a bit of history and information about the area. Wear sturdy, nonslip footwear and bring a water bottle, sunscreen and insect repellent. Meet at the head of the Cochituate Rail Trail at Concord and School Streets in Framingham. We’ll be crossing Route 30 and following the future trail route through Natick. Leashed dogs are welcome. For more information, contact David Longden at 508-901-5909. Join Framingham photographer Lynne Damianos of Damianos Photography for a stroll around the 63-acre Greenways Conservation Area, a portion of the former Paine Estate, purchased by SVT and the Town of Wayland in 1995. Historic sites, woods, open fields, wetlands, the Sudbury River shoreline and Paines’ pet cemetery make Greenways a remarkable place with nearly two miles of trails, many of them old cart paths. Lynne will provide tips for successful photography with your camera/phone. All ages and abilities welcome. Meet at the kiosk, 24 Green Way, Wayland. Questions? - Call 508-358-2980. Rain date: Sunday. Athenaeum Hall is a 19th century Saxonville historical landmark. During its storied past it had many uses, including hospital, jail, newspaper press room for The Saxonville Mirror, polling place and school. It was also used as a hall for dances, lectures, plays, religious services, sporting events, veterans' meetings and wedding receptions.